Pokemon 3: The Movie – Spell of the Unown, 「結晶塔の帝王ＥＮＴＥＩ」 (lit. “Emperor of the Crystal Tower: Entei”, officially Entei: Lord of the Unknown Tower) released in Japan on July 8, 2000 and on August 21, 2001 in America. Around this time, many of the children who were caught up in the initial Pokemon frenzy like myself were beginning to lose interest in the franchise and it’s common to hear them recall Entei: Lord of the Unknown Tower (hereby referred to as Entei) being the last Pokemon film they watched in their youth. Entei‘s story revolves around an archaeological researcher named Dr. Sully Snowdon (Spencer Hale in the English dub) and his daughter, Mii Snowdon (Molly Hale in the English dub). Snowdon, on a research trip to study ruins containing information about the mysterious Pokemon known as Unown (pronounced as “Unknown”), a species of Pokemon that reside in an alternate dimension and can supposedly bring the objects of a person’s imagination into the real world. Snowdon gets trapped by the Unown in their dimension after fiddling with ancient tile pieces that contained pictures of Unown on them. His assistant who accompanied him during the trip reported Snowdon as deceased to Snowdon’s household and his daughter, leaving them with the box of ancient tiles as the last memento of Snowdon. 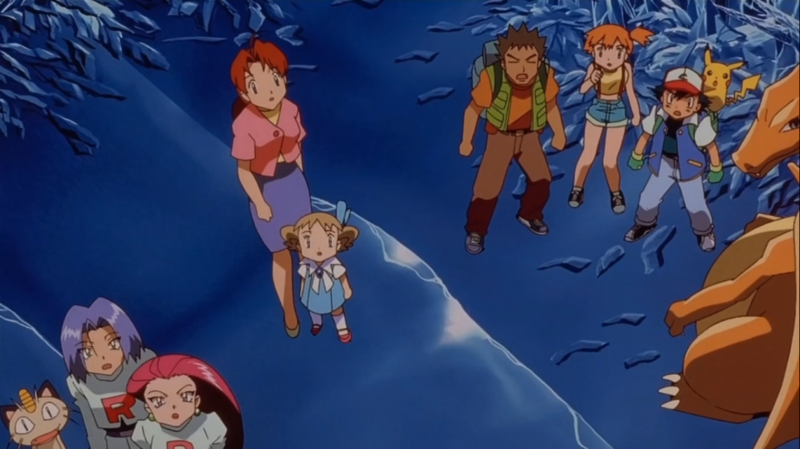 The crystallization begins to slowly spread to the town where our protagonists, Satoshi (Ash Ketchum in the English dub), Takeshi (Brock in the English Dub), and Kasumi (Misty in the English dub) are currently staying at. The trio get involved after Entei captures Satoshi’s mother, who was also staying in the town. Satoshi and his friends rush into the Snowdon mansion to save Satoshi’s mother as well as release the town from the Unown’s grip. I criticized the previous film in the Pokemon movie franchise, Revelation-Lugia, for being a poor standalone film. Revelation-Lugia assumes prior knowledge about the lore of the legendary Pokemon that appeared in the film and the plot tie-in to the concurrent Pokemon anime sailed over some people’s heads. While it still attempts to connect with the events of the Pokemon anime, Entei does a considerably better job than Revelation-Lugia in explaining the significance of the movie’s starring Pokemon within the film without expecting viewers to be an avid fan of the games or the anime. Part of the reason Entei does a good job at showing off the power of the titular Entei is due to the many impressive Pokemon battle scenes. Throughout the movie, Satoshi and his companions participated in Pokemon battles that showed off a wide variety of Pokemon battling it out in fantastic environments dreamed up by Mii and brought to life by the Unown. The last third of the movie is dedicated to the climactic battle between Entei and Satoshi, in which Satoshi’s Charizard joins the fray for a fire-type Pokemon showdown that makes the movie worth watching by itself. On the other hand, Entei has some serious plausibility issues that limit the drama. It’s established very early on that the Pokemon envisioned by Mii could be as powerful as she wanted — a very silly story device. In a few of the Pokemon battles that we saw Takeshi and Kasumi participate in, we see their seasoned Pokemon, developed throughout the entirety of the TV anime, get defeated by Mii’s imaginary baby Pokemon simply because she wills them to win. The most egregious example would be Takeshi’s reliable Onix being taken down by a single Rollout attack from Mii’s imaginary Phanpy, a baby Pokemon. Though a powerful Pokemon in his own right in the Pokemon games and other media, Entei’s power in this movie felt hollow and cheap due to the established gimmick that Mii’s imagined Pokemon can be as powerful as she wills them. While it’s cool seeing Satoshi’s Charizard fight this mythical Pokemon, it’s ultimately a hopeless battle that the audience knew would end in Entei’s favor anyway, simply because of this uninteresting, limitless power. Entei provides a commentary about the problems of a busy, dysfunctional family that is unfortunately all too common in modern society. It’s an interesting idea, but the execution leaves a lot to be desired. In the original Japanese script, Mii’s mother was revealed to have left her family because she couldn’t stand Snowdon’s obsession over his Unown research. Despite the fact that Mii loves and misses her mother (in the post-credits, she comes back and Mii immediately runs to hug her), Mii clings to Satoshi’s mother and deliriously claims that she is her true mother. I found this plot point problematic, undercutting the emotional connection we are supposed to feel with Mii and her broken family. This theme of dysfunctional families is never explored in any real depth and I can only say that it’s a shame that it’s not explored further. Revelation-Lugia veered off the course that Mewtwo Strikes Back set and I have to give Entei credit for trying to correct course and trying to find what makes a Pokemon film good. One of the big things that made Mewtwo Strikes Back so great was how thoroughly it explored the ethics and morality of cloning. We lost this rich exploration of a complex issue when Revelation-Lugia chose not to explore any such topic at all. Entei at least acknowledges that such a theme adds value to a Pokemon film and tries to add some emotional and intellectual heft. While it did adjust the course for future Pokemon movies for the better, Entei itself is unfortunately a rather mediocre film that feels like it was created haphazardly, with some ambition about how to be great, but poor cohesion and execution. In many ways, Entei is an experiment in which the Pokemon movie series; you can feel the filmmakers trying to figure out how to use the franchise to make a compelling, standalone feature. The bad news is, the film is not a major success. The good news of all this is that the lessons earned from Entei were not in vain as we shall see next time when we look at Movie #4, Celebi: A Timeless Encounter. Brian Terrill's 100 Film Favorites - #15: "Pee-Wee's Big Adventure"